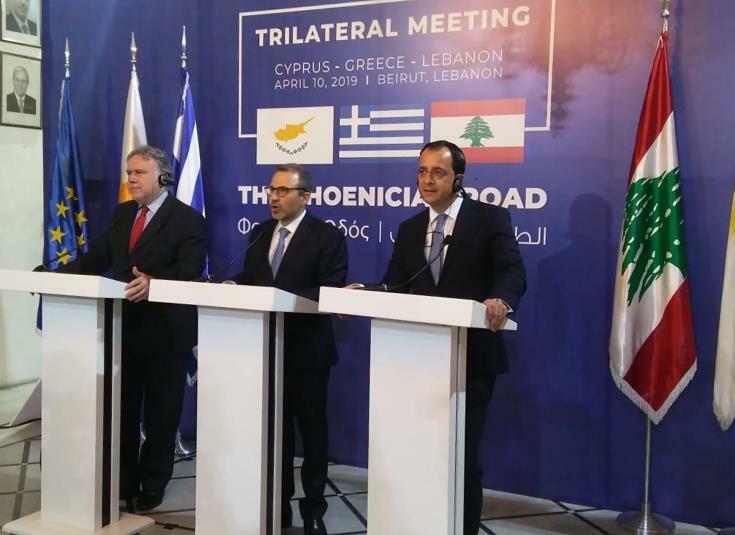 The Cypriot Minister of Foreign Affairs, Nicos Christodoulides, participated in the works of the first official tripartite ministerial meeting of Cyprus – Greece – Lebanon held in Beirut, along with his counterparts from Lebanon, Gebran Bassil and from Greece, Giorgos Katrougalos. A joint statement was adopted within the framework of this meeting, according to which the three Ministers recognized, inter alia, the importance and value of the tripartite cooperation mechanism and reaffirmed their strong commitment to further expand and deepen their countries’ cooperation in this context, as well as identify synergies in various areas of common interest for the benefit of the citizens of the three countries. According to the Joint Declaration, the three Ministers also agree that this tripartite cooperation, as reflected in their shared values, the culture and heritage of their countries, is based on the respect for international law and the aims and principles of the Charter of Fundamental Rights of the United Nations. The Joint Declaration also expresses the satisfaction of the three Ministers in identifying the initial priority areas for cooperation, namely Tourism, Higher Education, Culture, Economy and Trade, and illustrates their agreement to submit specific programs falling into these areas before the first Tripartite Cooperation Summit, which was decided to take place in Cyprus in 2019. For Nicosia, the cooperation in the energy field, with Lebanon as well, is multidimensional. It is based on the fact that the Permanent Secretariat for Tripartite Cooperation Mechanisms with countries in the region and the establishment of a National Coordination Mechanism for Tripartite Cooperation issues will officially begin its work in Cyprus within the next period. Already according to our information, foreign diplomatic delegations have begun staffing this secretariat with officials and technocrats. As it was known, the Secretariat as the core of a permanent basis for cooperation between the parties, will substantially contribute to the aim of regional integration for the countries of the Eastern Mediterranean by analogy with other regional integration cases and to promoting security and stability in the relations of the states as well as the region in general. Yet, it works for Nicosia as another level of the country’s security since the eastern Mediterranean during the present time and in the future will be a source of both energy and geostrategic developments. The issue with the lifting the US embargo on Cyprus and the strategic cooperation with the US on maritime security and counter-terrorism, etc. contained in the joint declaration signed last year between Christodoulides-Pompeo is part of the equation that is completed with the presence of giant energy companies in the Cypriot EEZ. This is the strategic plan of Cyprus, that is, its promotion as a security country in the Eastern Mediterranean and the creation of synergies that will promote this level of security in a troubled area, and it is in this way that it is being formulated.